A friend recommended this to me – I finally got around to getting a bottle and OH MY, heaven for the face. If you’re in a stuffy office, had a hot day in London on the tube, and even on a flight, a few spritzes of this on your face and you feel fresh and new and clean. The smell is minty, fresh and soothing. The 30ml bottle is perfect for hand luggage and I won’t fly without it again! I obtained a sample of this about a year ago and was so disappointed that although I loved the sample, there was nowhere to purchase this, so I had to file it away with the other unobtainable fragrances that I had sampled. But I was absolutely delighted to discover that Escentual.com stock this and will ship to NZ! So I ordered it and anxiously awaited it’s arrival, hoping it was as beautiful as I remembered. Alberto Morillas is one of my favourite perfumers and he has not disappointed with this. It is an etheral floral-aquatic with such clarity, you can almost pinpoint every note individually, yet they combine to create a beautiful harmony. It does remind me of L’eau d’Issey but is done 100 times better. If I could go back and marry my sweetheart I would be sure to wear this. I also have to mention the exquisite design of the bottle. The picture just does not to it justice; the bottle is stunning to see and to hold. I am so happy to have this in my collection and although I wouldn’t normally purchase a 100ml size, I feel that it won’t be enough! This is a real, timeless men’s classic, created I think back in the 30’s by the French perfumier Caron. Think of Gatsby, transatlantic liners and the boulevards of Paris. A rare cologne that has stood the test of time and which suits all men, young and older. The top note of lavender is prevalent at first, but soon other note come through: musk, amber, and woody tones, leaving a sensual and appealing warmth. This is one of those few men’s colognes that is appreciated as much by the men who wear it and the women who catch scent of it. This is the first Daniel Sandler lipstick I have ever bought, but I’ve been so impressed with the results. I bought the colour ‘joy’ which is much more pink and less purpley than it looks on the swatch on-line; to me that’s a good thing! It glides on beautifully, looks great (with a little bit of shine but not overpowering) and the texture is incredible – feels like lip-balm. My new go-to lipstick for sure. I didn’t wear make-up – I just couldn’t win, each item I bought ended up in the bin. Then I heard of Avene, and thought I’d give it a try. The results are amazing, I really could cry! The lotion is silky on my skin, red and sore. It’s calmed right down, I couldn’t ask for more. Six weeks down the line and my problems have gone, so thank you Avene for a job well done. Review your purchases at Escentual and we’ll choose 5 of our favourite customer reviews of the month to receive a £20 Escentual gift voucher each. Sounds good, right? Review your past purchases here. 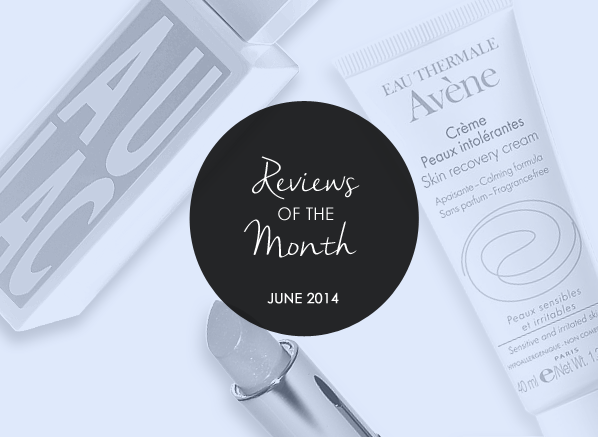 This entry was posted on Tuesday, July 1st, 2014 at 2:52 pm and is filed under Reviews of the Month. You can follow any responses to this entry through the RSS 2.0 feed. You can skip to the end and leave a response. Pinging is currently not allowed.